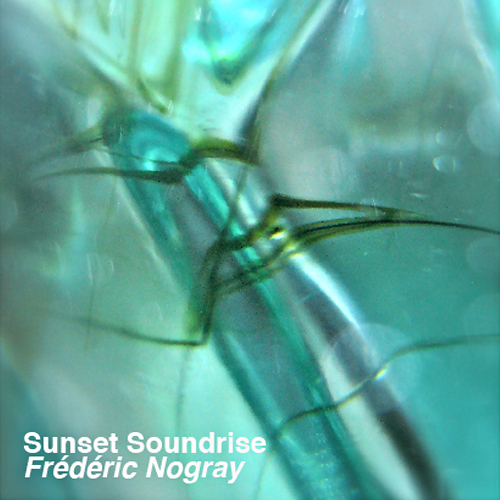 Frederic Nogray’s Sunset Soundrise falls into the rainforest field recordings category. I was intrigued when I read on the press release that during the process of installing his equipment in the particular location where he wanted to record, Frederic discovered that it was a possible experiment with deep quietness. Where there is sound, there is time. Time changes and sounds move along with it and with them changes the light, the colors, the humidity, the heat, the smell of the soil and the flowers. The microphone records, alone, witnessing the gradual emergence of the sounds of the nocturnal life where the sound of dead fruit falling from the trees coexists with the thick net of insects and bugs that breathes incessantly. I am tempted to believe that this exotic setting is natural and real but it actually is a shortened version of a longer recording taken in a rainforest during sunset between 4:30pm to 6:30pm, at this precise moment where the day gives way to the night. Nogray writes “In these near silent places, each sound – every piece of information – comes to us in more and more detail as minutes and hours pass. This composition is an attempt to share this particular way to deal with time”. I have already agreed with him on the temporal side of his intent but let me explain, I don’t find these places near silent, not at all. They are busy, ceaselessly evolving into complex repetitive patterns that my ears gradually adjust to. They don’t intrude immediately like the sound of an ambulance but they accumulate in my head, they circulate inside my body and become bigger and perhaps less natural, almost like the sound of broken cables and electric circuitry. The hour passes and I listen to the growing sounds inhabiting the privacy of my space and turning its calculated edges to rounded echoing chambers recalling my room in Brighton and how it was transformed when I first listened to Jean Claude Risset’s Sud. Not quite quiet though. I don’t want to sound as if I am de-exoticizing the quietness of the rainforest. On the contrary, the minuteness of its sounds made me realise that I have been living in cities for many years and that my idea of the quiet perhaps has changed. Once, I tried to revisit the sound of a night owl that used to sing non-stop when we spent our summers out in the village. Back then I thought that this was the only sound the night would make, a sense of calmness and quietness framed by the distant song of the bird. When I went back many years later I discovered that what I was left with was a fictionalised rendition of a past fragmented memory. In that respect, I understand Nogray’s notion of dreamlike sonic compositions and that’s how I want to remember Sunset Soundrise; as a recording that made me think and realise.